How do I invite participants to the virtual classroom? Virtual classroom participants: How do I invite participants to the virtual classroom? Once you click on “Start now”, your classroom will initiate and will simultaneously invite students of yours inside. Once you have the link copied, you can send it to your student in any way that’s convenient to you. For example, you can send it via text, messenger, email, etc. Through the participants list inside the virtual classroom. 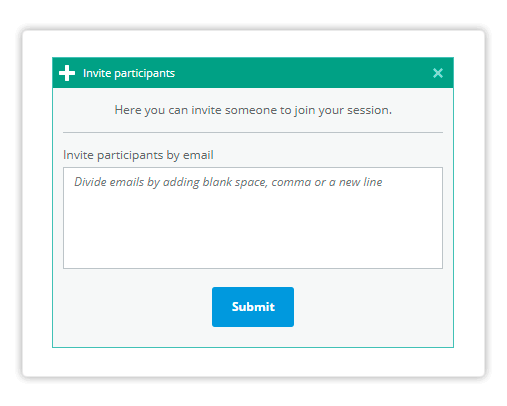 The + button located on the right side of the participants list in the room allows you to invite participants to the session via e-mail. The way this is done is identical to the way you would do it when opening the room. Once clicked, the icon opens a new window (shown below). This allows you to put in the email address(es) of the participant(s) you want to invite. They will receive an invitation with an access link within several seconds.